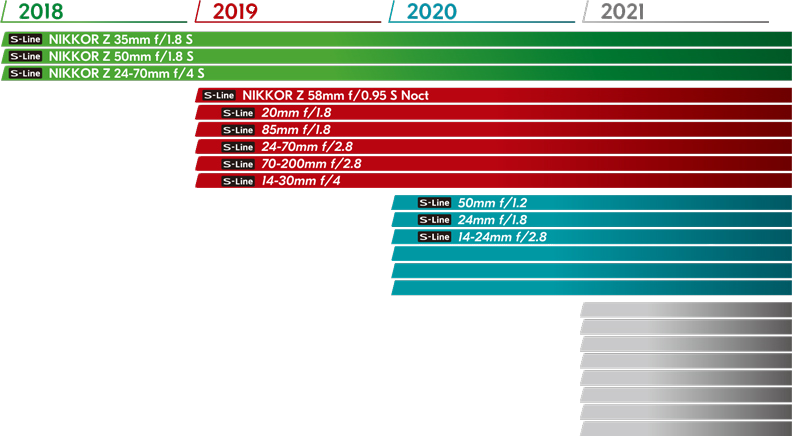 As Nikon’s offers its first flagship full-frame mirrorless cameras with the release of the Z-series, the future of professional photography is looking mirrorless. Not only is Nikon responding to multiple full-frame mirrorless offerings recently announced by its competitors, it is also creating an entirely new lens mount – the Z-mount. This indicates that Nikon is fully invested to the mirrorless game, and it’s here to stay. 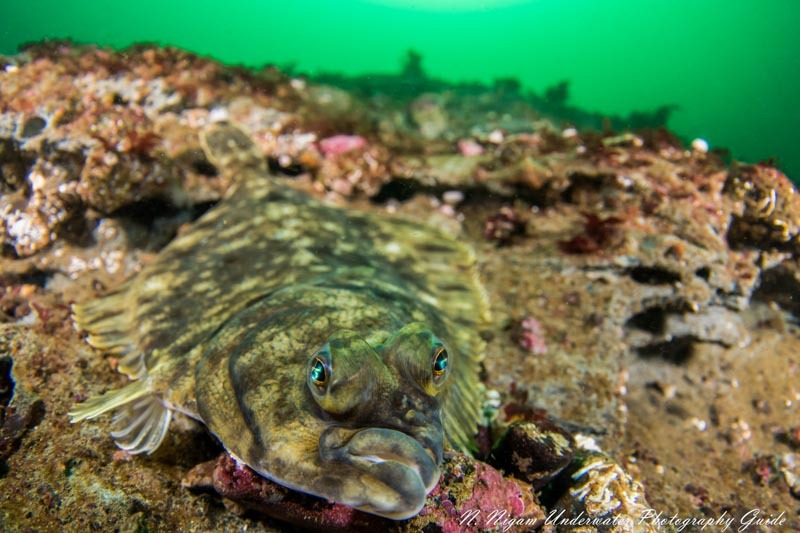 So with that, it’s time for professional underwater photographers to seriously consider mirrorless systems and anticipate the technology that will be offered in the future. 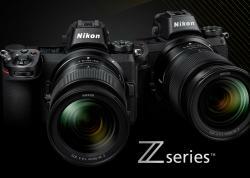 Nikon certainly hasn’t disappointed on the technological front with it’s first generation cameras, the Z6 and Z7. Both offer top image quality, excellent autofocus speed, an easy to use EVF, and mind-blowing resolution. 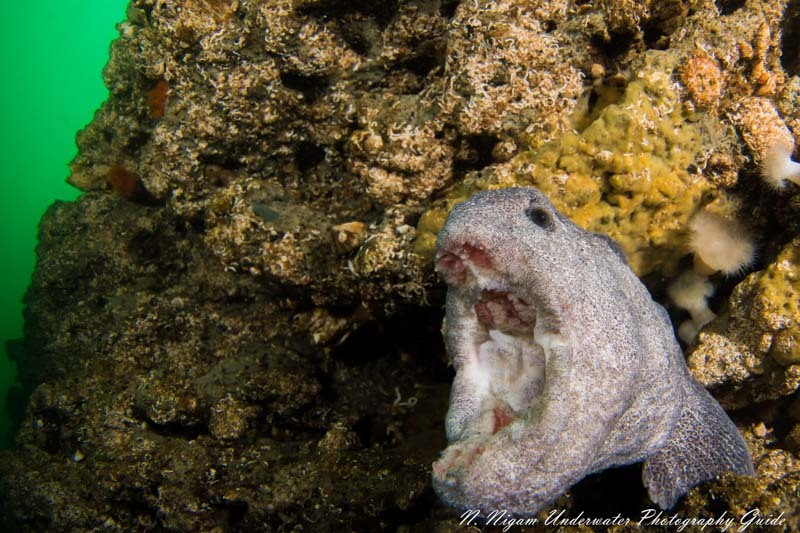 But the real question for underwater photographers is whether underwater photographic technology has kept the pace. 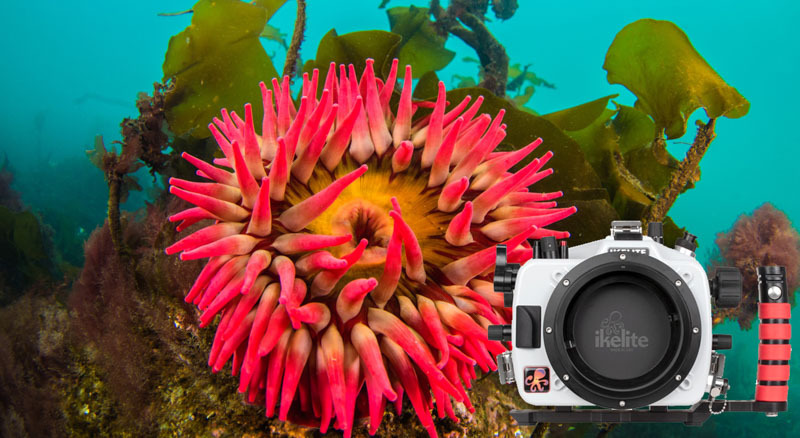 One thing is for sure – Ikelite produces a housing that can meet and exceed the needs of any photographer looking to push the Nikon Z6/Z7 to the limits. I’m not just saying that, I used it….. 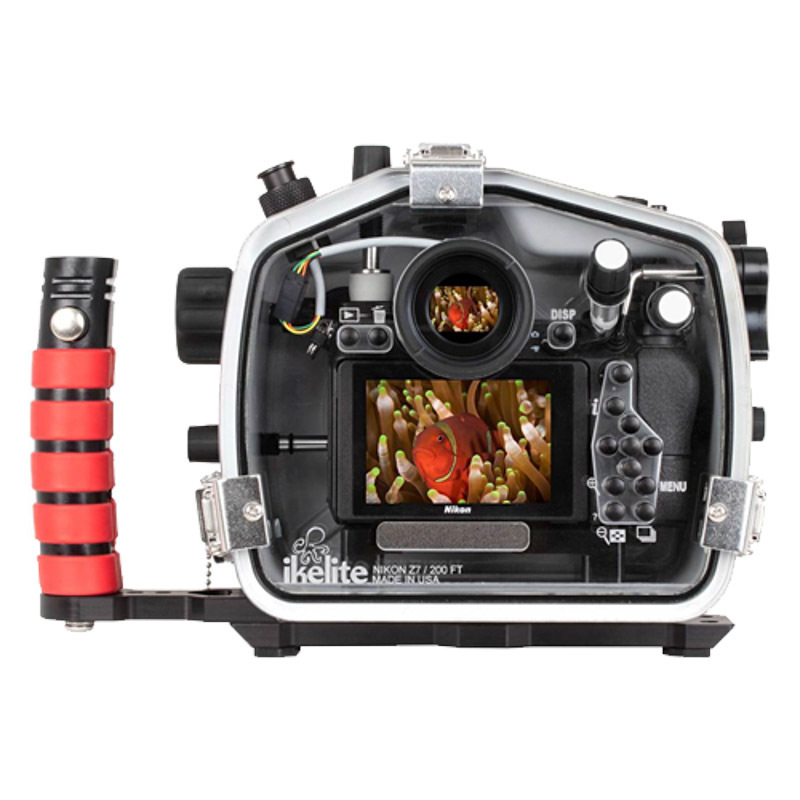 The Ikelite Z6/Z7 Housing is available now at Bluewater Photo! If you haven’t yet read our review of the Nikon Z6/Z7, click here to read the full review. Otherwise, below are some key specs for both the Z6 and Z7. 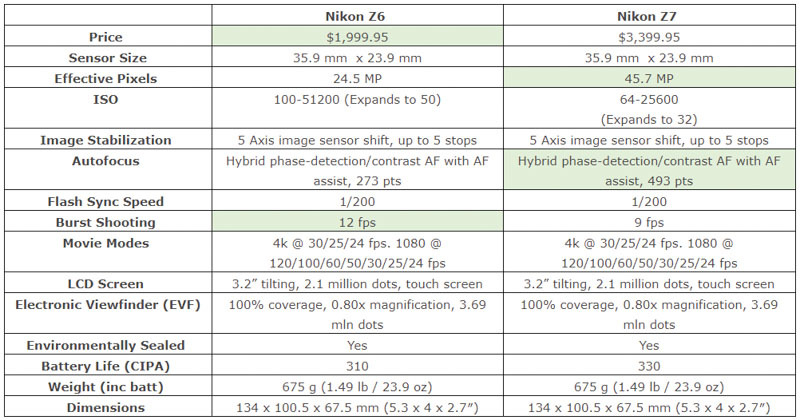 As you can see the only real differences between the cameras are their price, resolution, number of AF points, burst shooting, and native ISO. Beyond that there are very little differences. In my review, I found that image quality often matched the Nikon D850 (except when banding showed up in very underexposed areas of the image), autofocus performed as good or better than the Sony A7R III, and the EVF worked without issue. However, battery life isn’t great and there’s an unfortunate lack of Nikon’s famed 3D tracking autofocus. Now to the housing…. Yes, the housing works with both the Nikon Z6 and Z7 cameras! 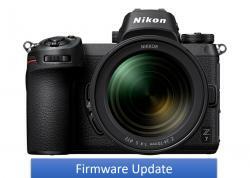 Price: $1,695.00 – you got it folks, that’s about half the price of the Nikon Z7 body and still $300 less than the Z6 body. Other manufacturers can’t match that price. Made of corrosion-free polycarbonate, the Ikelite housing is lighter than competitor housings. It is rated to well below recreational dive limits. The vacuum feature and clear back makes it very easy to ensure against leaks and visually catch them when they do happen. Other housings don’t have this clear back. The electrical TTL with Ikelite strobes is seamless. Although some buttons, the diopter dial, and the joystick is not accessible, I didn’t even notice when using the camera. This is because the Fn1 and Fn2 buttons are not as ergonomic as in other Nikon models (and not needed with the new info menu), the joystick isn’t very useful (even topside it’s really slow for choosing focus points), and the diopter can be set once before diving. I find that some photographers rush to brush off Ikelite as being the “budget” option. There’s no denying that – the price is unbeatable. But equating money with performance is a serious folly. When a housing “performs” it means that it keeps the camera dry, it keeps a light profile underwater, and it allows full access to the camera’s controls. Ikelite does all this. And most every other reputable manufacturer does this as well. True differences in housings come down to ergonomics, size, build quality, and port systems. But with the Z-series, Ikelite offers a convincing argument for starting from scratch, and entering the full-frame mirrorless world with Ikelite. Why? The accessories. The nice thing about ergonomics with the Ikelite housing and the Nikon Z6/Z7 is that many aspects of the system are customizable. The curved levers on the housing (e.g., shutter, back AF button) are very workable, so it is easy to press the shutter half way down if need be rather than using back button autofocus. The shutter lever can be extended for a back button focus oriented system or remain short for half-press shutter focus. The info button makes scrolling through settings much easier with this housing. It should be customized to suit your needs before the dive. All dials moved quite easily though the buttons could be a little stiff and close together at times. I found that the zoom gear could have trouble latching on at times, so it’s very important to be careful to make sure the lens is secured in the zoom gear notches while sliding it into the housing. One of the concerns many people have with the Z7 is that the F-mount and Z-mount lenses result in port sizes that make the underwater systems the same size as other DSLR systems. This is true. The Z7 is a large mirrorless camera and the lenses don’t help the size. But despite the bulk, it is significantly lighter than competing DSLRs like the D850. When combined with a lighter housing like the Ikelite housing you will notice the weight difference. There are both benefits and drawbacks to the size of the Ikelite housing. Ikelite tends to focus on weight rather than the physical dimensions in their design. 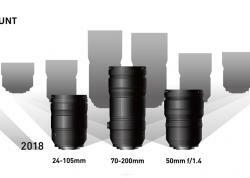 Ikelite housings, the Z7 included, are generally larger than competitor housings. For example, the volume of the Ikelite housing comes out to be 11.52 liters whereas Nauticam is at 6.35 liters. On the other hand, by weight, the Ikelite housing clocks out at 4.7 lbs whereas Nauticam’s housing is 6.66 lb. Polycarbonate is strong, corrosion resistant, and light. Personally, I like this larger but lighter design. Due to the extra volume, the Ikelite housing is more buoyant underwater and my arms never got tired using it, even without floats. Its important to note that the larger size can also add more drag underwater. 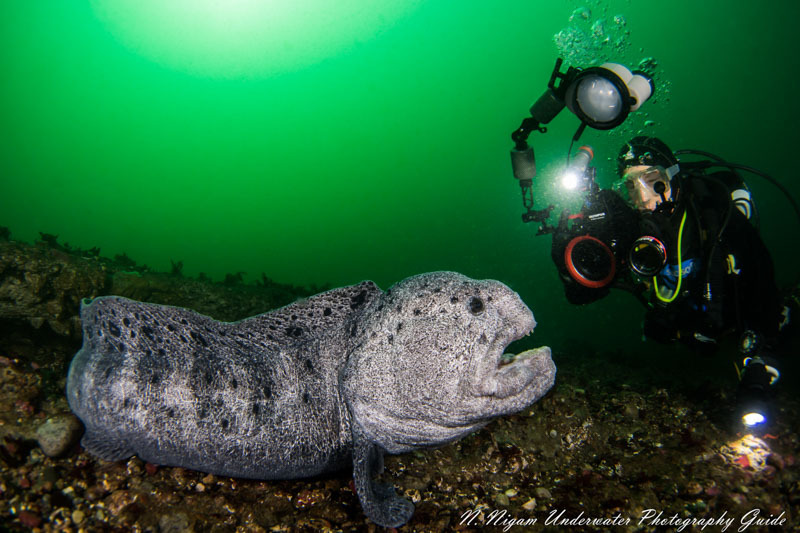 A few of my test dives included long uphill climbs – it was noticeably easier to carry the lighter Ikelite housing with the Z7 than other manufacturers with cameras such as the Sony A7R III or D850. The build quality on the Ikelite Housing is excellent. I really didn’t have any concerns about flooding or damage during the rugged cold water dives I put it through. The triple latch system is tight and secure with a compression o-ring on the back that doesn’t need to be lubricated. [Other o-rings need lubrication]. Although the buttons can be tight at times, it’s clear that they are water tight and resistant to damage. The laser engraved control symbols on the back are a nice touch as they won’t fade or fall off. A mounting plate attaches to the camera which slides into the housing. Once the back of the housing is on, the camera is very secure and does not move. The vacuum system tops everything off with extra security and peace of mind – reinforced further by the clear back. Like the housing, Ikelite’s port system is all about customization. With different port extensions that all connect using the same screw system, Ikelite makes it easy to adapt your system to any lens. This is a must because the Z-mount underwater options are yet to be released and the old options require an additional FTZ adapter. Due to the lack of Z-lens development, for the moment it’s necessary to use your old F-mount lenses underwater. Although the ports fit great with the FTZ adapter, like other housing manufactures, it’s necessary to first put the body in the housing without the lens before attaching the lens and port. The same can be said for disassembly – the lens must come off the body for the camera to come out of the housing. This can be a bit frustrating (especially with zoom gear), but it is necessary. It’s important to watch where you put your screws when switching your ports or extensions. They’re small and easy to lose! With all the extra money you save purchasing an Ikelite housing, the world is your oyster when it comes to accessories. 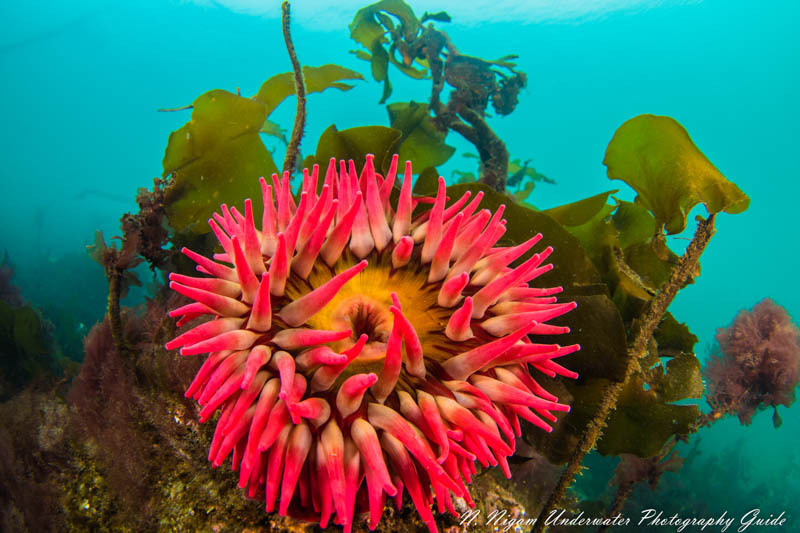 I had the opportunity to shoot the Nikon Z7 in the Ikelite housing with dual Ikelite DS-161 strobes, an Ikelite DL1 DS Link Nikon TTL Converter, a 45 degree magnified viewfinder, a Nikkor 8-15mm lens with a smaller dome port, and a Nikkor 105mm f/2.8 VR macro lens with a flat port. At the end of my time shooting the system, I didn’t want to let it go. The TTL control with quick strobe recycling times, combined with the Z7’s image quality really makes any shot possible. Visual accessibility to what many consider to be the world’s best EVF (electronic view finder) with the magnified viewfinder bestows the capability of doing a full dive without taking your eye off the viewfinder! Finally, Ikelite’s trim weight system will make any videographer’s mouth water. Talk about neutrally buoyant image stabilization! The Ikelite DS-161’s are professional strobes. Yes, they’re big, but they’re big and powerful. If you need to get quick, crisp, well-lit shots, having a big battery pack that can handle burst shooting is a must. 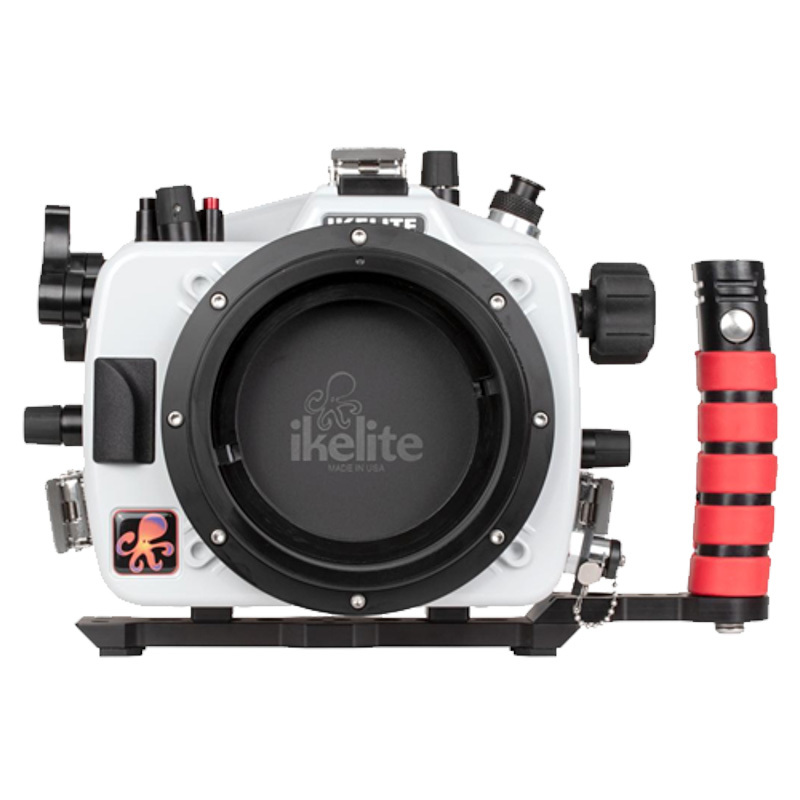 The Ikelite housing has the capability of connecting to the Ikelite DS-161 strobes with sync cords. Combined with a 1.4 second recycle time at full power, you’re shooting with a semi-automatic. Burst shooting with the Z7 and these strobes creates an opportunity to capture the perfect moment at 47 MP resolution! Video lights on each strobe are a nice touch. 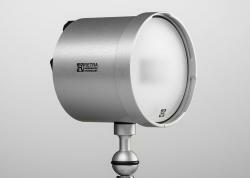 Many people buy the Ikelite strobes to be used with the Ikelite TTL converter. The TTL converter creates a link between the camera’s hot shoe and the Ikelite strobes establishing direct communication between the two. I was surprised with just how accurate the TTL was. Unless I was shooting in a quick burst mode where the shutter outpaced the recycle time, the TTL was accurate every time. 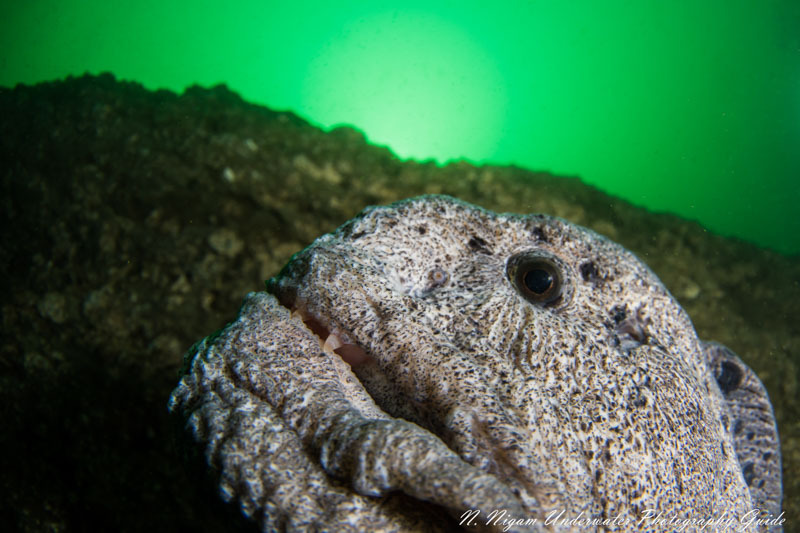 After turning my strobes on, I honestly didn’t have to think about the strobes for the rest of the dive. The only time where I considered turning TTL off was if I wanted a little more dramatic, close-focus wide-angle light and purposefully underexposed the shot. People love the EVF (electronic view finder) on the Nikon Z6/Z7. With excellent refresh rates and dynamic range, it’s almost as good as an optical viewfinder with the additional benefit of reviewing photos and change all your settings in the EVF. But there’s little use for an EVF if you can’t see it. Ikelite’s 180 degree and 45 degree viewfinders make this benefit accessible. 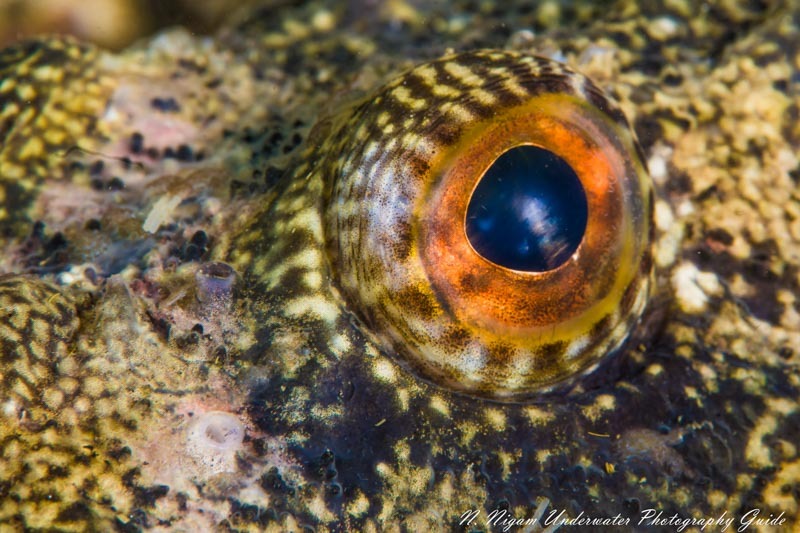 In fact, it’s now possible to do your whole dive with your eye planted in the viewfinder, shooting photos. A viewfinder is perfect for making quick settings changes in the heat of the moment. I used a 45 degree viewfinder which I found was great for composing macro photos in hard to reach places. Unlike many other manufacturers, Ikelite housings can be positively buoyant. This is especially true with larger ports. A trim weight system includes an adjustable trim rail that attaches to the bottom of the housing that can attach to a hard two-pound dive weight. Combined with the Z7 housing and the large port (no strobes), the Z7 system can be perfectly trimmed and neutrally buoyant underwater. 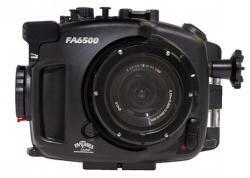 This is great for underwater videographers looking for additional stability! 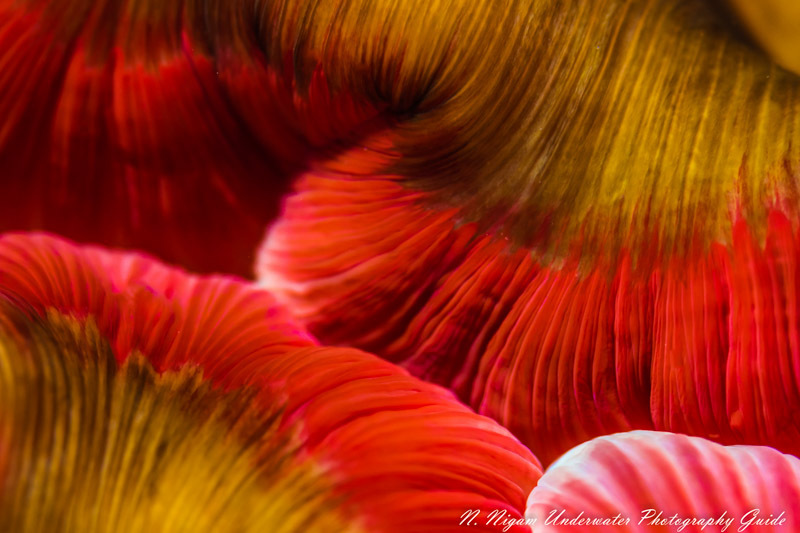 To shoot macro with the Ikelite housing and Nikon Z7, I used the Nikkor 105mm f/2.8 VR macro lens, Ikelite flat port, two Ikelite DS-161 strobes, and Nikon to Ikelite TTL converter. It was a very smooth and accurate set up. 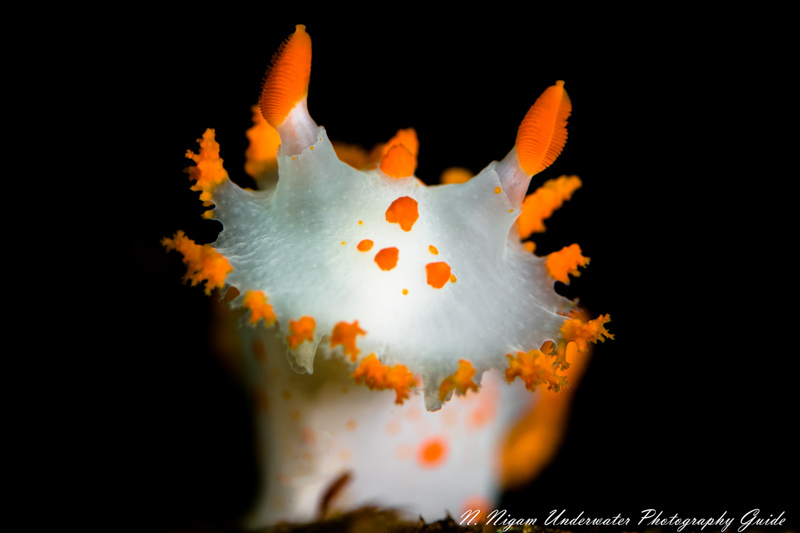 With accurate TTL and quick recycle times, it was great getting multiple quick shots of small subjects like nudibranchs to ensure perfect focus. The dials helped with quick shutter speed and aperture changes necessary for changing depth of field and exposure in the photo. The 45 degree viewfinder was great for composing photos while remaining off the bottom to reduce kicked-up sand. I do wish, however, that in the case of macro, the housing was a bit smaller to get into nooks and crannies with a little more ease. The large working distance of the 105mm helps negate the effects of a large housing. 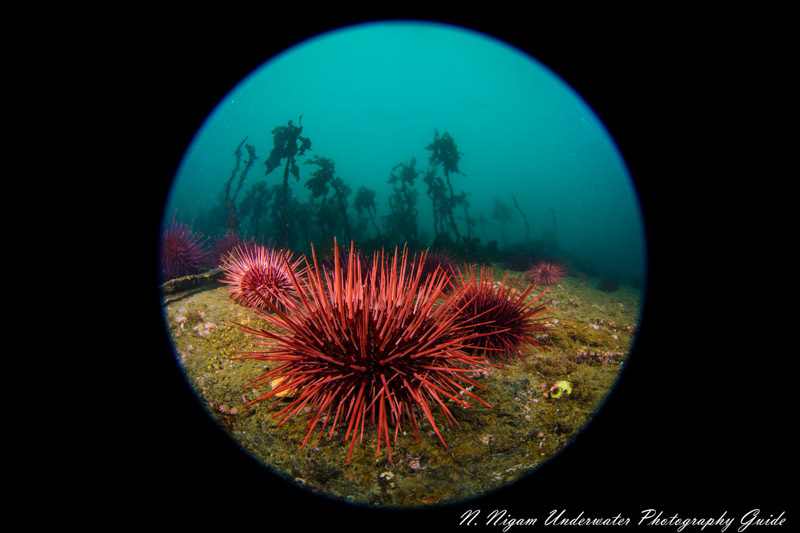 To shoot wide with the Ikelite housing and Nikon Z7, I used the Nikkor 8-15mm circular fisheye lens, small dome port, two Ikelite DS-161 strobes, and Nikon to Ikelite TTL converter. What a joy to shoot…. Quick recycle times, great resolution, relatively high burst speeds, and accurate TTL all came together to create a system that takes amazing photos with very little effort. It almost felt like all I needed to do was point and shoot (very quickly at that). The one downside with the Z7 was the slow movement of autofocus points which made it a little difficult to keep up with moving subjects. It’s also important to move ISO to another button, like the info menu, so that it’s easier to adjust instead of pressing the ISO button and moving the dial. Because burst shooting is so quick as well at the Z7’s AF speed, I found that half press shutter was actually better than back button focus when shooting with the Ikelite housing and strobes. 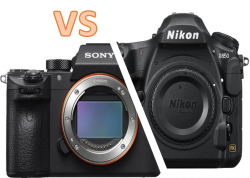 The Nikon Z6 and Z7’s video quality rivals the top cameras on the market. Nikon really got its colors right with the D850, and the same holds true for the Nikon Z7. The Z7 will be a true video competitor to the Sony A7R III, Panasonic GH5, and Canon EOSR. And if you’re a hard-core video shooter, Ikelite might actually be one of your best options. With the design of the Z7 housing, Ikelite really focused on trim. The trim weight rail system, combined with a large port, makes the Ikelite housing neutrally buoyant and almost perfectly in trim. This is a great addition for wide angle video footage and ads more image stabilization to an already excellent 5-axis IBIS system. 1. If setting up a magnified viewfinder, use the provided tool to loosen the viewfinder that comes with the housing. Then take it out and screw in the magnified viewfinder. Make sure the o-ring is flush with the housing and unobstructed and tighten the viewfinder with the tool. 2. Screw your camera body tripod mount onto the tray mount with a coin. 4. Slide body and tray into the housing. Attach the electronic sync cord attachment to the hot shoe. Latch back cover. I recommend turning the camera on before latching the back cover. 5. Slide lens into the port (if using an FTZ adapter) and make sure the zoom gear lines up with the tabs in the port. Attach the lens to the body. 7. Open the vacuum valve by pressing the side button and pulling out the cap. Attach your vacuum pump and pump until it reaches 10-15 mm of Hg. Replace the cap. Make sure you test to make sure the valve has held pressure before you get in the water. 8. Add ISO control to your info menu, as well as any other controls you might need to change quickly during the dive – like white balance, burst mode, and autofocus mode. 10. After the dive, first release the pressure from the vacuum valve, by reattaching the vacuum and holding the lever. 11. Take apart the housing in reverse order. • Make sure zoom gear works before diving – ensure that the tabs on the ribs that wrap around the lens firmly slide into the tabs on the port gear. 5. Are videographers that want to make use of stabilization with the trim rail weight system. All in all, the Ikelite housing for the Nikon Z6/Z7 is fully functional, tough, customizable, with options for tantalizing accessories. It might be budget friendly, but it’s not any less professional than other manufacturers. I was personally amazed by the Nikon Z7’s performance with this housing and a range of accessories. Ikelite really had the needs of professional photographers and videographers in mind when considering the design and functionality of the housing. Before the Z7, I had never shot a mirrorless camera or housing with such a high "keeper" rate. I recommend this housing for anyone who would like to take the Nikon Z6 or Z7 underwater, and especially to those who are interested in the wide range of accessories that come with it. It’s hard to be disappointed.